There's plenty to enjoy with Iron Crypticle. It will definitely suit fans of retro aesthetics and arcade-esque titles, but shooting using the right stick in only eight directions is a hindering experience which is likely to frustrate players, in an otherwise solid game. While a bit slow to get going, there's a great amount of variety in Iron Crypticle once the action heats up. Iron Crypticle is a fan and fast-paced twin-stick action release on PS4 you can enjoy on your own or in a full four-player multiplayer session. While you technically don't progress much in the game during each run since when you die you have to go back to the start, you do unlock new weapon times to grab as power-ups as well as add new entries to your items encyclopedia to complete your collection, so if you're the type of player who wants to 100% a game, you will definitely end up being addicted to this cycle, and I recommend you get this one on PS4. Overall, I had time with Iron Crypticle, especially once I started to get better at the game. You'll need to play this one over and over again to be able to survive for longer during your subsequent runs, so be sure to stick with the game for a bit! Iron Crypticle is one of the best newcomers to the dungeon crawler genre. While it doesn't come without its share of issues, it's one of the most exciting takes to come along in some time. So grab yourself a few buddies and get ready to die a lot. Just like any good dungeon crawler, Iron Crypticle is all about learning from mistakes, no matter how many times Game Over assaults the television screen. Iron Crypticle is the perfect example of a game whose whole is worth more than the sum of its parts. In many ways, Iron Crypticle is old fashioned to a fault – the lack of persistence and awkward 8-directional movement and shooting mires it in the past, bereft of any modern gameplay enhancements. Simply put; Iron Crypticle is a blast to play and it's even more fun with friends. The game I played a few years ago is largely in-tact here. But Iron Crypticle is refined, enhanced, and more enjoyable than before. It is a game that begs to be played in co-op, and is now available on systems to allow for that to be done with ease. Playing it solo, it is challenging and rewarding each time you play. I still don’t know what a “Fisticle” is, and I have an idea what a “Crypticle” is, but I do know that Iron Crypticle is a solid game that reminds you of games from your childhood, but freshens up the roguelike genre in exciting ways. 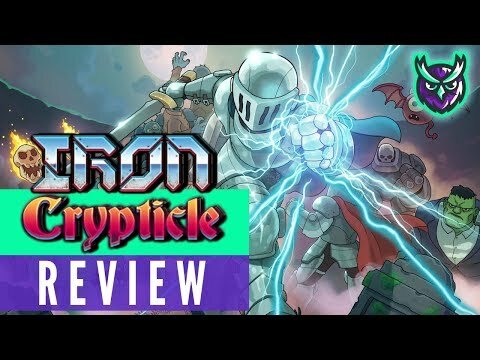 Iron Crypticle can be fun, I enjoyed it in short burst sessions and there's definitely that "just one more go" factor and for high score junkies this will appeal to you. It's not a terrible game, there are just better examples out there.